This area is rocking out with music this summer. Obviously, we have Alive @ Five Thursdays, but SDSSD also sponsors another concert series, Pops in the (Columbus) Park, Wed. July 16, 23, and 30th. That's classical/oldies/Broadway, and you are allowed to bring picnics (and, I assume, alcohol). The Norwalk Jazz Festival is this Saturday. I'll put in a special plug for my friend Damon Grant, pictured above. He's a great percussionist and the VP for Artist Relations for the festival. The jazz fest starts at noon, Damon Grant Project plays at 3, and the Fest ends at dusk. It's at Veteran's Park in Norwalk; tickets at $25 in advance, $30 at the door. The lineup is impressive; there are several Grammy winners and nominees. Um... Norwalk is kind of out-cooling us with Jazz Fest, I have to say. Even Darien has one Aug 15. Monster B's now has reggae every Sunday on the deck from 5-9pm. This Sunday's band is called Anthem, and there will be $3 Red Stripe beers. Monster B's has bands Thurs-Sun every week, so go to their website for the latest. This one's interesting: every Thursday in July, First Presbyterian Church on Bedford, AKA the Fish Church, will have concerts on their lawn. The Advocate says, ...an hour of music from the Carillon Tower followed by an hour of live music. The concerts are free. Audience members may bring a picnic dinner. I'm not sure I want to eat while bells ring over my head, but maybe the bells are prettier than I think. I wonder if the church is doing this on the same night as Alive at Five to give people a less wild option? I also wonder if you're allowed to bring your own alcohol to First Presby's Concerts along with your picnic dinner. Let's see... the Bartlett Arboretum has classical music on Sundays at both 10am and 5pm. 16 and under free, non-members $10. Next week, my friend Jeff's band, the Terryl Lee Band, is playing on Friday, July 18th, at the Bottega Lounge in New Haven, CT. No cover. On Thursdays, Thataway Cafe on Greenwich Ave. features singer-songwriters at their Songwriters Den. Check out Faifield Theatre Company and Acoustic Cafe (Bridgeport) for more music options. 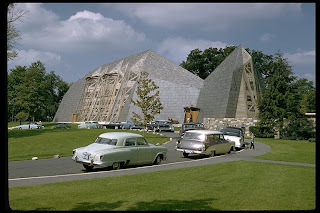 Here's an awesome pic of the Fish Church from the 1950s. You can click to make it larger. Thing one: Anthem is awesome. I saw them open for Toots & the Maytals back when I lived in Danbury at the beginning of the 21st century. They did a killer cover of "Another Day in Paradise" by Phil Collins. Thing two: Stamford's outdoor music fests seem to me to be pandering to the +/- 30 crowd (of which I am a proud member) at the expense of everyone else. While I, along with everyone else who graduated high school in the mid-90s, can't wait for Boyz II Men, I'm way more curious about Los Lobos. I'd love to see them do a reggae evening at A@5, or a hip-hop event. And not, like, MC Hammer. Put on something slightly challenging. I bet people'll come out. When Eve 6 plays "Inside Out" next Thursday, I wonder how many people in the audience will say the [insert cover band that plays at Tiernan's here] version is better. We waded through the crowd to the front of the stage. Some old, leathery guy who looked like he had on a wig and fake nose was doing something with a saxophone. We could barely hear anything above the traffic on Washington Blvd. and the chattering of the heavily imbibing crowd. I didn't know there was music at Thataway! that sounds cool.